In this episode we’re talking about a female in her mid-30s with migraines, head sensitivities, left ear plugged, sense of brain fog, anxiety, chest pain…whole gamut of symptoms and of course a reverse curve. And this is her x-ray of her neck from her side, and I could really show you other x-rays as well, but just in the interest of time we’re just going to focus on this one. I want to point out a few things here: what we’re looking at is a kind of a classic reverse curve and we would call this a reverse s-curve. But she has quite a quite a bit of an S… And what you’re going notice here is the way that her first cervical vertebra is tucked up underneath her skull. And the way that both her third and fourth and fifth cervical vertebrae go behind this line. This line is called a depth measurement. We’re using the depth method for looking at the reversal of her curve. And rather than her curve, of course, going this way it’s that. And what you’re looking at here is her after image. This was taken 11 months later, so this is quite a bit of time and this is quite a bit of transformation over that time. Most of her symptoms have resolved or diminished within about a three weeks time frame including the migraines, the left ear being plugged, the head sensitivity, and those [symptoms] kind have ebbed and flowed over the next several months as she went through these changes. So, this is the before and the after image with the depth method lines dropped in. You’re seeing c1 move closer towards c2 and then of course right in through here at three and four you should see that finally these vertebra segments are actually in front of this line here as opposed to being behind it. So the the neck is actually taken out of the s-curve. Now he c3 is a little bit mal-positioned still yet. We’ll see if her body continues to change on that. But overall there’s been a significant change in the alignment, and in fact, if you actually measure it out there’s actually been a 14 millimeter change at the fourth cervical vertebra, so this is quite a huge shift over about nine months – I’m sorry – eleven months, with her coming out of that reverse cervical curve. 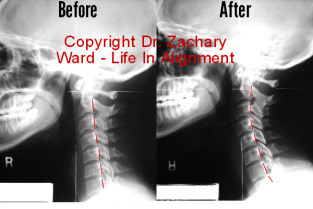 Again if you have any questions about this case or any case in the series that you’re seeing, Alignment Matters: “Ten patients in ten minutes” – you can give a shout out here at LIACHIRO.com/contact. If you are in the Metro Detroit area feel free to give us a call at the office line 248-598-4002, and talk to my assistant and mention this video.